Statements like that are not based on reality. Saying that is like saying you don’t like broccoli before you try it. Or dragon fruit, for that matter: It’s weird-looking, it doesn’t resemble any other fruits you’ve tried before, and it seems to have been designed by a child. So it must not be for you. Even though it may taste like a mix between kiwi and happiness. But creativity, unlike that happy-looking fruit, is something we have all tasted. It’s something we were born with. Yes. We were born creative. That’s the main argument in Sr. Ken Robinson’s TED talk (the most popular TED talk ever – so it must be true, right? :)) and I hope this idea is more widely accepted 10 years later. 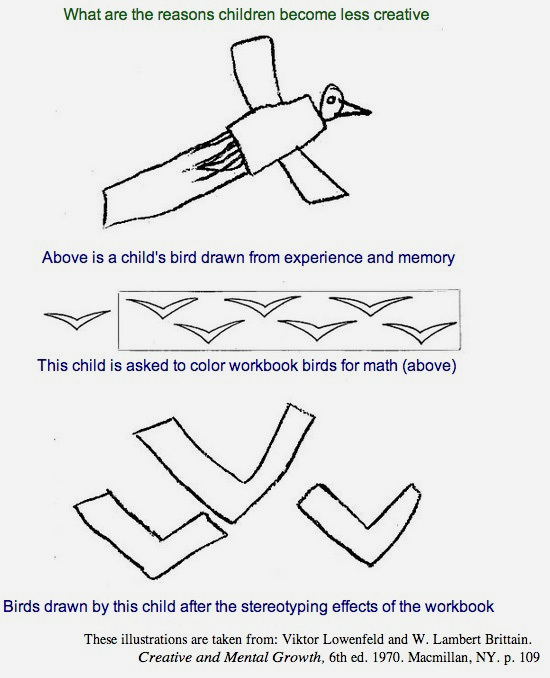 A math book unwittingly told a child how to draw birds. And the child learned and moved on to learn new things. She will draw all birds the same way now, unless something brings her back. That’s a sad image for me, and looking at it reminds me of the reason I write about creativity. It’s in us, we just have to dig it back up. An education system based on conformity is one problem, but there’s another roadblock to creativity that is far more palpable and addressable: self-judgement. Creativity is very personal, and every creative has to deal with the fear of being exposed. But if anyone faces that fear and keeps at it, they will be surprised at how creative they can be. When people who don’t consider themselves creative have an idea, they look at it. Judge it and dismiss it before they even have the next one. It’s not that we’re not supposed to judge our own ideas, it’s that we need to DEFER the judgement of our ideas until we have a lot of them. This quote from a chemist is refreshing – plus it reminds us that creativity is not exclusive to the industries perceived as creative. Go, chemistry! When I walk into the war room here in the office where we pin all the ideas the creatives had for an advertising campaign, I walk among hundreds of sheets of paper scattered around the floor. Those are the old ideas – the ones that died, so the better ones can have a place on the wall. Later that day, they’ll go to the recycle bin and they’ll never make their way back from there. We are OK with that, because we only want the best ideas. So don’t get too attached too fast. There’s always going to be new ideas. You may think you have run out of ideas, but as soon as you try a different approach, or you have a different stimulus, you’ll find your brain firing up again. An idea is made of connections between concepts floating around in our minds, and the possible connections grow exponentially as you learn a new concept and drop it into your pool of knowledge. Sorry Julius, you were amazingly wrong. This sometimes sounds counter-intuitive. First we’re not supposed to be too precious, now we need to fight for it? Yes. We start with divergent thinking, creating multiple solutions for a given problem. But then, we’ll carefully narrow down the ideas to the best solution. We take feedback, we improve our thinking. We make it tight. Then you fight for it, because chances are someone from another department, or your superiors or your spouse will come to you and point flaws, shortcomings in your idea. But you can’t let this be your clay horse. A professional creative needs to fight the resistance and believe in his/her creative capacity. 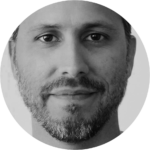 I can tell you from experience: ideas are very hard to judge before they are implemented. Most people can’t tell a good idea from a bad one. That’s where the creative’s belief in his/her idea is so important. If that belief is not there, the idea will die. And for all we know, it could have been a great idea. It’s not like self-judgement is not going to be there. It’s a human thing – we are all judgemental of everything. When it comes to being creative, it’s about not letting judgement deflate us. It’s about leaving it for later, and giving yourself time to explore solutions. Being creative is certainly not comfortable. I’d describe it as exciting and adventurous. Because you can’t be creative inside your little box. It’s outside the boundaries of your comfort zone that brilliance happens. It takes some practice, like anything else. Going outside your comfort zone in little was every day is a great exercise for creativity. So if you haven’t yet, have a taste of dragon fruit. Turns out it’s delicious.